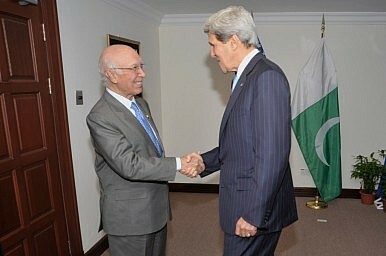 A recent Pakistani delegation to Washington continues a thaw in relations. With the 2014 U.S. troop drawdown from Afghanistan fast approaching, a recent high-level Pakistani delegation to Washington is seen as a possible thawing in relations between the two countries, critical to a smooth transition in Afghanistan. “The resumption of this dialogue after a gap of three years symbolizes the inherent resilience and significance of this relationship,” said Sartaj Aziz, National Security and Foreign Affairs Advisor to the prime minister of Pakistan, who led the delegation. Officially, the trip allowed Aziz and Secretary of State John Kerry to review the progress of the strategic dialogue’s five working groups: energy, security and nonproliferation, defense, law enforcement and counterterrorism, and economics. Beneath the surface, Aziz sent a clear message that Pakistan was interested in improving relations with the U.S., according to Michael Kugelman, senior program associate for South and Southeast Asia at the Woodrow Wilson Center. Analysts see Aziz’s visit as an opportunity for the two countries to go through the motions and for bureaucracies to work together. “The main purpose of the trip was to carry forward a thaw in relation Nawaz Sharif began in October,” said Madiha Afzal, a Non-Resident Fellow at the Brookings Institution and an Assistant Professor of International Development at the University of Maryland. Aziz’s trip follows Prime Minister Nawaz Sharif’s visit to Washington in October, which was designed to reset relations that were damaged in 2011 after Osama Bin Laden was killed in Abbottabad by U.S. forces, 24 Pakistani soldiers were killed in a NATO strike, and CIA contractor Raymond Davis was arrested, and later released, for allegedly shooting two men in Lahore. “The situation was so bad in 2011, that the only way to go was up, and they have,” said Kugelman. When considering the overall relationship between the two countries, it is “on an upward trajectory, but not a steep one,” Afzal said. Analysts believe that this is a time when both countries need each other. According to Syed Moazzam Hashmi, a political and security analyst based in Islamabad, Pakistan needs the U.S. because of the economic assistance it can provide. “Pakistan is a cash hungry country… no one other than the U.S. can provide this much cash,” Hashmi said. The top priority for the U.S. in the region is ensuring that its troops are able to leave Afghanistan safely during the drawdown in 2014, said Lisa Curtis, senior research fellow at The Heritage Foundation. The hope is that Pakistan can exert some influence on the Afghanistan Taliban to ensure the safe withdrawal of U.S. troops, Curtis said. She pointed to a recent move by Congress to cut military and development aid to Afghanistan in half, noting that there was no such reduction in aid to Pakistan. Even though the cut is seen as a response to Karzai’s unwillingness to sign the Bilateral Security Agreement (BSA), it shows a certain level of commitment to Pakistan, Curtis said. Despite Aziz’s recent trip, points of contention remain between the two countries. Curtis said the U.S. continues to have concerns about the current negotiations between the Pakistan government and the Tehrik-i- Taliban Pakistan (TTP), safety of nuclear weapons in the country, and a general approach to extremism. Analysts also maintain a cautious tone when looking at U.S.-Pakistan relations because of the drawdown from Afghanistan in 2014, as it could prove to be an “inflection point” in relations, Kugelman said. While Aziz voiced a common fear in Pakistan—that the U.S. would abandon the region like they did towards the end of the Cold War—analysts believe the U.S. may have learnt from history. “If you spend ten years and longer [in Afghanistan], you will have interests,” Hashmi said. The U.S. has invested far too much in Afghanistan, economically and militarily, this time around for it to simply abandon the region, and postwar relations with Pakistan will be different this time, Hashmi said.